Buiten Verwagten Guest House: This Victorian-style home was built in 1840 by a transport carrier and it is now a national monument. Buiten Verwagten has a reputation of providing luxurious and modern comfort. 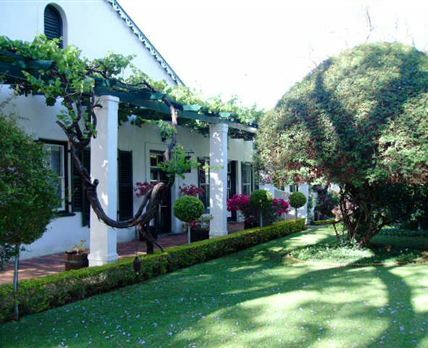 Peet and Cheré invite you to enjoy their heritage home, set in a formal Victorian garden and nestled in the heart of historical Graaff-Reinet. Together with two luxurious rooms in the main house, there are three self-catering garden suites with air-conditioning. These are ideal for those who value their privacy and independence. Buiten Verwagten has a reputation for excellent, unobtrusive service which includes a buffet breakfast. For added pleasure, there is a lapa at the main pool area where you can relax while enjoying the beautiful garden. In addition, safe off-street parking for your vehicle is provided. Translated into English, Buiten Verwagten means ‘beyond expectation’, and those guests who return to our guest house would agree with this title. It is hard to imagine the cool, green oasis that awaits you when you arrive at Buiten Verwagten Guest House after a long journey through the hot, dry, rugged and beautiful Karoo. A warm welcome by the owners and staff, and the well-appointed, carefully decorated accommodation will guarantee that your stay is beyond expectation. Click here to enquire at Buiten Verwagten Guest House.